A classic recipe for chili con carne that uses ground turkey with red kidney beans, chili powder, tomato and spices. One of the clearest memories from my childhood has to do with chili. I was five, and was in my kindergarten class crying my eyes out with a terrible, painful ear ache. Lying on a big red pillow with tears steaming down my face, my Dad came and picked me up and brought me home. Now, my Dad loves to make chili, so that day, after a nice nap and some wonderful medicine to help my ears, we spent the afternoon at home making chili. The smell engulfed the whole house and I immediately started to feel better. After all, when you’re a five year old girl, spending the day with your hero, in my case my Dad, might be one of the best things in the world. I remember he let me stir the chili and it was so thrilling, it’s probably one of my earliest and fondest memories in the kitchen. Ever since then, I’ve loved chili. My Dad and I enjoy sharing our love for chili and trying out different recipes – he has his favourite and I have mine. 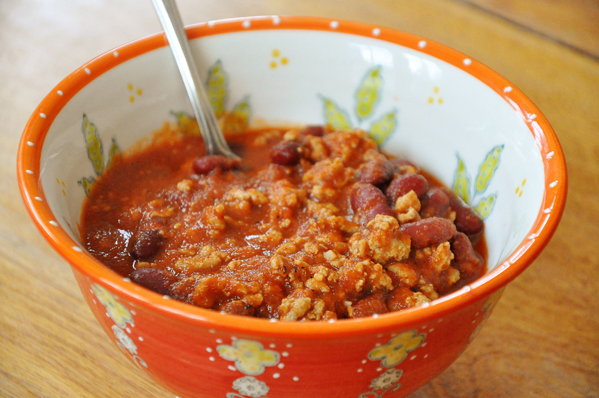 This is my favourite recipe and we both agree that this is a pretty mean and flavorful chili. This chili is made with ground turkey, because personally, I prefer the texture because it isn’t quite as tough as beef, but feel free to sub in ground beef if that’s your preference! A deeply flavourful and comforting chili that comes together fast enough for a weeknight dinner. Heat olive oil in a large pot, cook turkey over medium heat until fully cooked, crumbling throughout the process, about 5 minutes. Add onion, garlic, chili powder, Montreal Steak seasoning, cumin, salt and cayenne pepper. Allow to cook until very fragrant, about 2 minutes. Add in the crushed tomatoes and bring to a boil, reduce heat, cover and simmer for 10 minutes. Add kidney beans and continue cooking another 10 minutes. This chili is very quick and easy to make, it takes around half an hour. Let me know if you give this chili con carne recipe a try in the comments below. I love chili, especially simple chili. I have tried several recipes but have found that when done some are really tasty but you can feel the texture of the spices, like its gritty and I hate that. I hope this one doesn't have that issue. This will be my next try. @dixiedevil69 I didn't find this one to be grainy or gritty at all! Let me know how it turns out for you.